I did it again! I totally gorged myself this past week with Cadbury chocolate eggs, be they Easter Cream Eggs, Caramel Eggs, or those addictive little poppable Mini Eggs…Yes I ate them all…I do it every year, and every year I tell myself that I won’t buy them again next year, and then every year I buy them all over again! It’s a sickness really! To balance out all that chocolate eating I like to eat something light, refreshing like this Grapefruit and Snow Pea Salad. See what I did there? I can totally make it seem rational to eat a ton of chocolate…told ya it was a sickness! 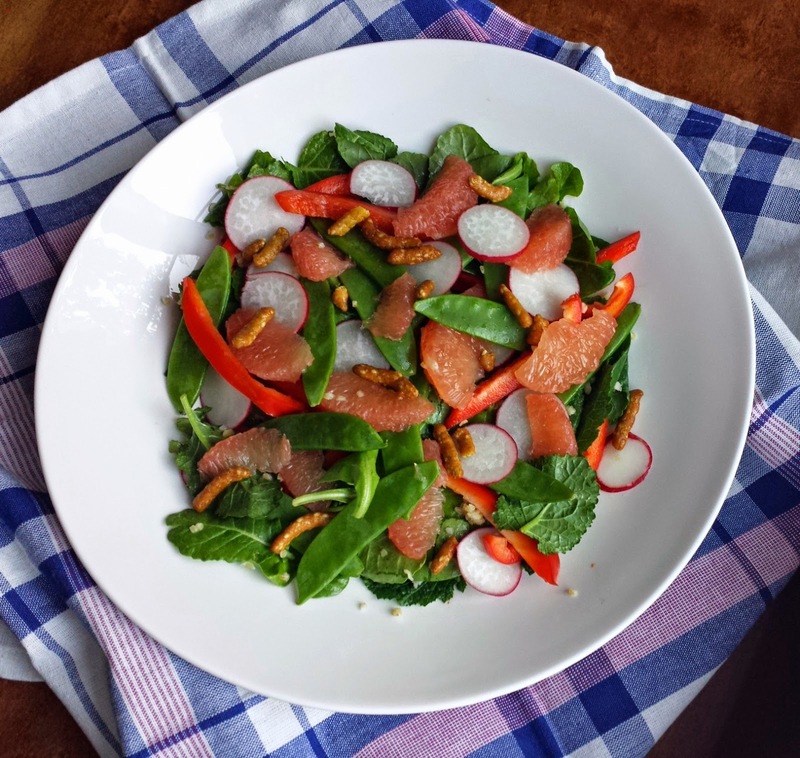 Any hoo…Grapefruit and Snow Pea Salad is a great balance of sweet and tart, and because it’s pretty low in fat you can eat a giant bowl of Cadbury Chocolate Eggs…errr…I mean salad, without a bit of remorse. Start by pouring 1/2 cup of boiling water over 1/4 cup of bulgur wheat. Place a piece of plastic wrap over the bowl and set it to the side to allow the bulgur wheat to absorb the water. Bulgur wheat has protein and fiber adding it to the salad will help you feel full for a longer period of time. ...And then use a sharp paring knife to cut down each side of the membrane, releasing the sections of fleshy fruit. The grapefruit supremes are in the bowl, and the membrane remains, go ahead and squeeze the juice from it (the membrane) before discarding it. Pour the pretty pink juice into a measuring cup. If you don't want to cut the grapefruit into supremes, you may just peel and slice the grapefruit into rounds; in that case, you will need an extra grapefruit just to juice for the dressing. Add the juice to a jar with the same amount of grape seed or canola oil, a minced shallot, a tad of dijon mustard, a bit of honey (the amount of honey that you use will depend upon the sweetness of the grapefruit), and a pinch of salt & pepper...Shake it up. To go in the salad are the grapefruit supremes, red bell pepper, snow peas and radishes (please ignore the shallots in the corner, they were for something else). Now that the bulgur wheat has absorbed the water, season it with a tablespoon of the dressing, as well as some salt & pepper. And then put the veggies on top so that all the pretty colors can be seen; sprinkle on some sesame sticks for crunch and yumminess...seriously, the sesame sticks make the salad! I eat the salad as is, but for Billy I added some seared shrimp; seared scallops, grilled chicken or pork loin would also be terrific. You could even use shrimp that has already been cooked. Toss some raw shrimp which has been peeled and deveined with a bit of the dressing (if you do this you will want to make some extra dressing), also season with salt and pepper. Sear the shrimp in a hot skillet in just a touch of oil. Place the shrimp on top of the salad. 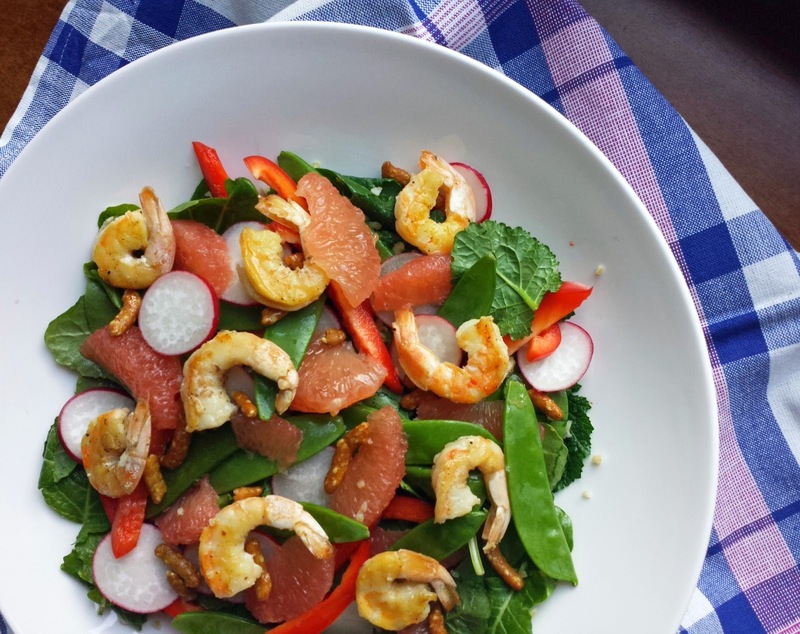 Grapefruit and Snow Pea Salad is light and refreshing and perfect to serve for brunch, lunch or a light dinner! 2. Make the dressing by adding to a jar, the shallots, Dijon mustard, 1 tsp. of honey, grapefruit juice, and oil, along with a pinch of salt and pepper. Put the lid on and shake well. Give it a taste; depending upon the sweetness of the grapefruit, you may need to add more honey. 3. Remove the plastic wrap from the bowl of bulgur wheat, if there is any water remaining, drain it off. Stir about a tablespoon of the dressing as well a pinch of salt and pepper into the bulgur wheat. 4. 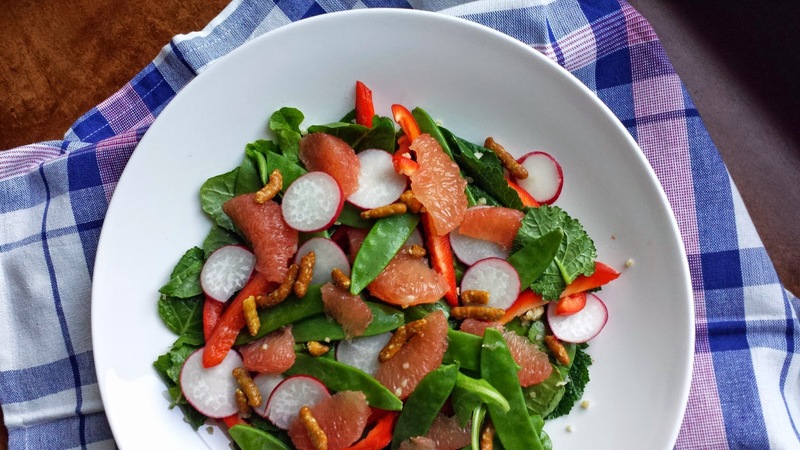 In a large bowl toss together the salad greens, bulgur wheat, grapefruit Supremes (or sections), snow peas, bell pepper, radishes, and sesame sticks. Serve the dressing on the side. Notes: *I cut the grapefruit over a bowl, into Supremes so that all of the juice is caught in the bowl, and then squeeze the remaining juices in the membrane using my hand. One grapefruit will yield about 1/3 cup of juice using this method. **If you don't want to cut the grapefruit into supremes, you may just peel and slice the grapefruit into rounds; in that case, you will need an extra grapefruit just to juice for the dressing. **This salad is also great served with seared shrimp or scallops, with grilled chicken or pork tenderloin. You could make double the amount of dressing and use half of it as a marinade.